So I don’t want to cook cupcakes all the time because of many reasons. But mostly because I always end up eating a large majority of the batch as my boyfriend doesn’t really like cakes! This does not work out well for me as i scoff them all in two seconds. It was a surprisingly tasty vegetarian dish. I enjoyed it, and had it two days in a row. It would be interesting to have it with pasta too and make a pasta bake out of it (add the pasta in when you put everything in the casserole dish and perhaps extend the cooking time until the pasta is done), or even boil some rice to have along side it. It’s up to you. I had it with a salad, and really enjoyed it. 2. Roughly chop the onion and split into two piles: one half is going in the vegetable mixture (keep this chunky) and the other is going into the tomato mixture (finely chop this). 3. 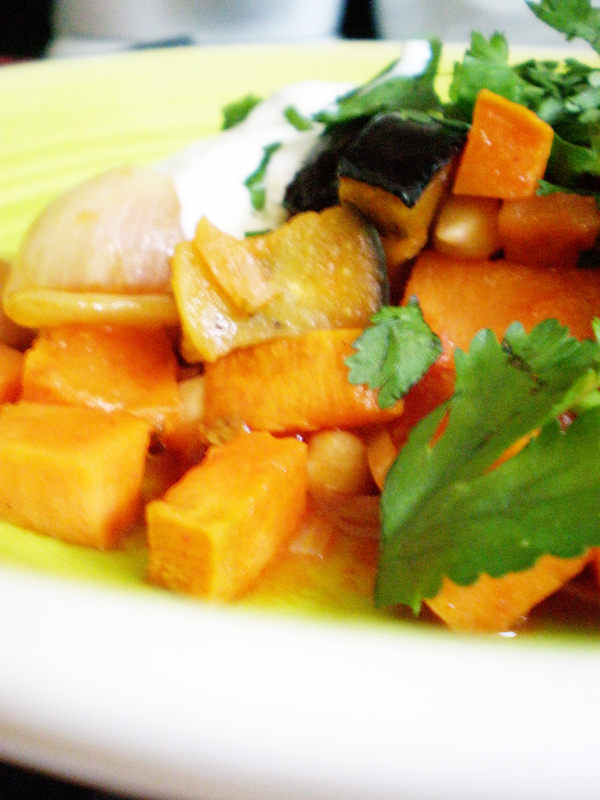 In a roasting tin add the chunky half of the onion, the sweet potato, aubergine and red pepper. Cover with the olive oil, mix together and roast in the oven for 20-25 minutes (depending on how chunky the veg is). Mix again at the half-way point so it doesn’t burn. 4. While that’s in the oven, fry the onion with some oil in a pan for 5-10 minutes on a medium heat. Add the garlic and paprika, mix, then add the tomatoes. Cook for five minutes on a medium-high heat, stirring. 5. Add the stock and chickpeas to the tomato mixture and mix well. 6. 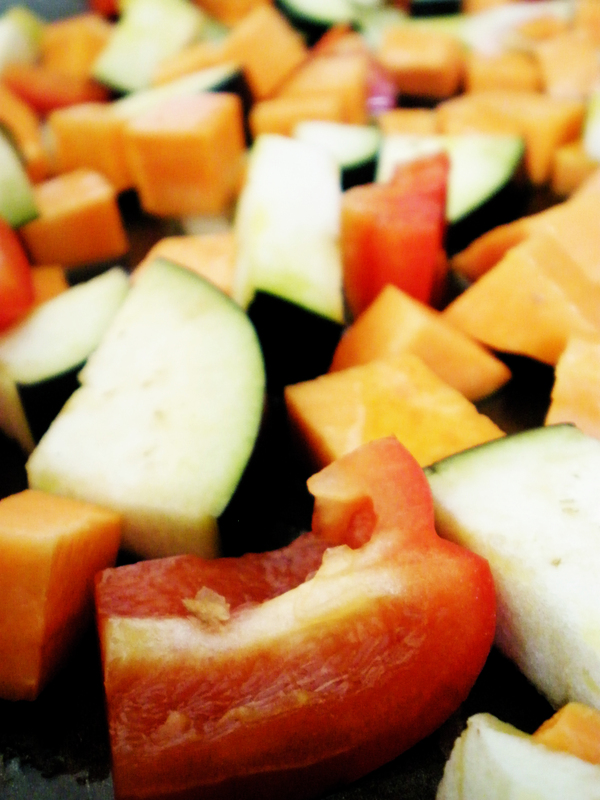 The vegetables should be roasted by now, so take them out. Transfer the tomato mixture into a heat-proof casserole dish or something similar. Top with the roasted vegetables. 7. Turn the oven down a bit to 190C and cook for 20 minutes, mixing again halfway. 8. Serve with chopped coriander and the sour cream. This makes enough for four. I had mine with lots of coriander and sour cream, which (obviously) made it nice and creamy. There’s a lot of juice left, so some kind of bread is a nice addition to the dish.